Bagui, MALI – Sanata Magnata is now in her late forties. For many years, Sanata traded smoked fish and root vegetables to feed her family. As a widower, she depended upon income from her small business to educate, clothe, and feed her children. 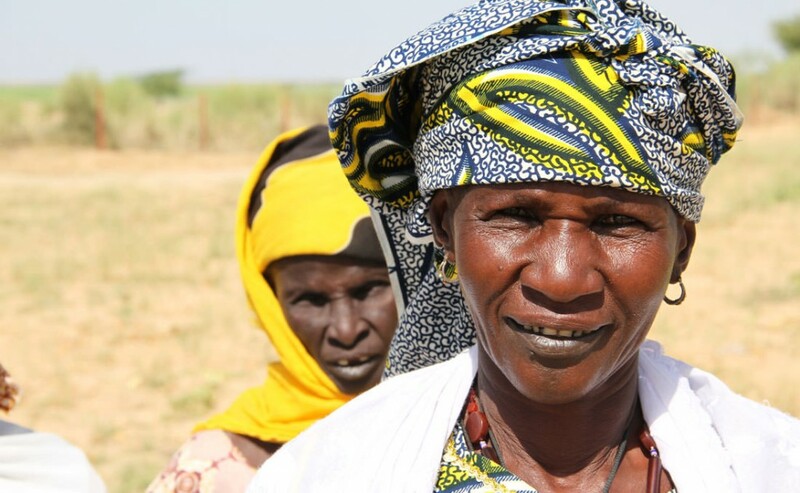 When political crisis struck Mali in 2012, Sanata’s family—like many in the region—were forced to flee the violence, leaving valuable assets behind. Sanata left her village, leaving all her belongings behind, out of fear that jihadist groups would enlist her children. When she returned 18 months later, her house was in ruins and rebels had taken most of her business supplies. Too many clients had defaulted due to the crisis, and local funds needed to recapitalize before issuing more loans. Out of work and homeless, Sanata fell back upon the generosity of her family and neighbors to keep her children alive. It was at this time that NEF was implementing efforts to address the immediate recovery needs of people in northern Mali and to restore livelihoods and food security in the region. Through the project, Sanata received a cash grant. She reconnected with her network of suppliers and distributors, replaced capital stolen in her absence, rebuilt her house using mud bricks in place of straw, and even purchased a canoe to increase her fishing activity. This allowed her to achieve stability, enough money to feed her family and send her children back to school. With food vouchers and cash grants, NEF was able to help thousands of people reestablish their livelihoods after liberation from the takeover by armed rebel groups. Near East Foundation economic recovery agents provided guidance to grantees in designing (or redesigning) income-generating activities for rapid recovery. Project beneficiaries reported improved living conditions and financial autonomy, as well as increased working capital and economic activity. Since that time, Sanata has gone on to benefit from various NEF activities in Mali including literacy education, financial management training, and agriculture and water management. Then going on to train in Bamana and Bozos to increase her ability to conduct business in multiple regional languages. These activities have equipped many women in the region with the knowledge and confidence to manage small loans and continue to develop sustainable sources of income. Sanata, seeing the need for other women to have access to the knowledge and resources she received, decided to pay it forward and has taught over fifty other women how to read and write, providing them with the foundation for further learning and engagement. She started as a member then became a leader of her village’s women’s association and market garden cooperative network that developed conservation and processing units for their products with help from NEF. She also contributes to the management and coordination of a larger market gardening network that includes around ten villages in four surrounding municipalities. Now running multiple income-generating activities, Sanata is regarded as a leader in female entrepreneurship and leadership. Further, she is a member of the communal committee of adaptation to climate change for the rural municipality of Korombana and attends local, regional and national meetings on this and other matters. One of her proudest roles includes her current role as President of the Board of Directors of Nayral, an independent women-lead microlending institution established by NEF in the early 1990’s that has since lent well over $11 million to more than 47,000 women to help them establish small enterprises. The same institution that allowed her to further her own business goals. In May 2018, Ms. Sanata participated in Bamako as a leader in the Microfinance Week organized by the Association of Microfinance Professionals in Mali. The Near East Foundation helps build more sustainable, prosperous, and inclusive communities in the Middle East and Africa through education, community organizing, and economic development.